Each one of us receives approximately 60 new mutations in our genome from our parents. This striking value is reported in the first-ever direct measure of new mutations coming from mother and father in whole human genomes published today. For the first time, researchers have been able to answer the questions: how many new mutations does a child have and did most of them come from mum or dad? The researchers measured directly the numbers of mutations in two families, using whole genome sequences from the 1000 Genomes Project. The results also reveal that human genomes, like all genomes, are changed by the forces of mutation: our DNA is altered by differences in its code from that of our parents. Mutations that occur in sperm or egg cells will be ‘new’ mutations not seen in our parents. Although most of our variety comes from reshuffling of genes from our parents, new mutations are the ultimate source from which new variation is drawn. Finding new mutations is extremely technically challenging as, on average, only 1 in every 100 million letters of DNA is altered each generation. Previous measures of the mutation rate in humans has either averaged across both sexes or measured over several generations. There has been no measure of the new mutations passed from a specific parent to a child among multiple individuals or families. The unexpected findings came from a careful study of two families consisting of both parents and one child. The researchers looked for new mutations present in the DNA from the children that were absent from their parents’ genomes. They looked at almost 6000 possible mutations in the genome sequences. They sorted the mutations into those that occurred during the production of sperm or eggs of the parents and those that may have occurred during the life of the child: it is the mutation rate in sperm or eggs that is important in evolution. Remarkably, in one family 92 per cent of the mutations derived from the father, whereas in the other family only 36 per cent were from the father. This fascinating result had not been anticipated, and it raises as many questions as it answers. In each case, the team looked at a single child and so cannot tell from this first study whether the variation in numbers of new mutations is the result of differences in mutation processes between parents, or differences between individual sperm and eggs within a parent. Using the new techniques and algorithms, the team can look at more families to answer these new riddles, and address such issues as the impact of parental age and different environment exposures on rates of new mutations, which might concern any would-be parent. 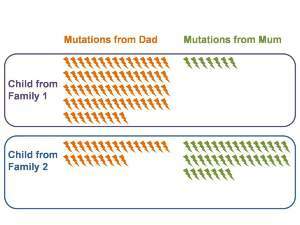 Equally remarkably, the number of mutations passed on from a parent to a child varied between parents by as much as tenfold. A person with a high natural mutation rate might be at greater risk of misdiagnosis of a genetic disease because the samples used for diagnosis might contain mutations that are not present in other cells in their body: most of their cells would be unaffected. This work was supported by Wellcome Trust, the Ministry of Development, Exploration and Innovation in Quebec and Genome Quebec. Deeply rooted in Montreal and dedicated to its international mission, the Université deMontréal is one of the top universities in the French-speaking world. Founded in 1878, the Université de Montr éal today has 16 faculties and together with its two affiliated schools, HEC Montréal and école Polytechnique, constitutes the largest centre of higher education and research in Québec, the second largest in Canada, and one ofthe major centres in North America. It brings together 2,500 professors and researchers, accommodates more than 60,000 students, offers some 650 programs at all academic levels, and awards about 3,000 masters and doctorate diplomas each year. The Wellcome Trust Sanger Institute, which receives the majority of its funding from the Wellcome Trust, was founded in 1992. The Institute is responsible for the completion of the sequence of approximately one-third of the human genome as well as genomes of model organisms and more than 90 pathogen genomes. In October 2006, new funding was awarded by the Wellcome Trust to exploit the wealth of genome data now available to answer important questions about health and disease. The Wellcome Trust is a global charitable foundation dedicated to achieving extraordinary improvements in human and animal health. We support the brightest minds in biomedical research and the medical humanities. Our breadth of support includes public engagement, education and the application of research to improve health. We are independent of both political and commercial interests. Can Genetic Therapy Help Kids with Angelman Syndrome Overcome Seizures?